PRODUCT DESCRIPTION Helichrysum italicum is a small perennial herb with narrow, silver leaves and flowers that form a cluster of golden yellow, ball-shaped blossoms. The name “Helichrysum” is derived from the Greek “helios” meaning sun and “chrysos” meaning gold, referring to the color of the flowers. Helichrysum has been used in herbal medicine since ancient Greece and the oil is highly valued and sought after for its many health benefits. Helichrysum is best known for its restorative properties to the skin, liver, and nervous system. 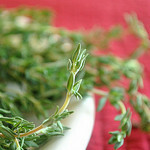 It’s frequently consumed to help detoxify the body and to promote circulation. Also referred to as Everlasting or Immortal Flower, Helichrysum is used in anti-aging products for its rejuvenating benefits to the skin. Helichrysum can help reduce the appearance of wrinkles, stretch marks, and scars, and it promotes a glowing, youthful complexion. Help relieve tension by massaging onto the temples and the back of the neck.